Iceni Warriors teaches MMA in our Norwich gym, to all skill levels, including total beginners. Get involved is this ever evolving, popular fight sport. Iceni Warriors MMA with Icon Jitsu Team offers MMA coaching with a 360 degree approach to coaching, using several years of experience in training mixed martial arts fighters of all levels. Qualified, fully-insured coaches with experience at the highest levels of the sport are here to guide you from beginner to professional level. Whether you are experienced and coming to us from another club and looking to improve your MMA striking or Jiu-Jitsu ground game, or you have never even stepped in the cage. Iceni Warriors and Icon Jiu-Jitsu team can take you where you want to go. Not only based in Norwich, the extended Icon Jiu-Jitsu famly stretches almost every continent. There are current Bellator, Cage Warriors, BAMMA and even UFC Veterans across the team. As well as multiple World, European and national Jiu-Jitsu champions both based locally In Norwich and across the team. Iceni Warriors also hosts one of the finest striking coaches in the UK, having coached and currently coaching MMA fighters at the very highest level; UFC. Check out our timetable and book in your lesson today! Muay Thai is arguably the most common stand-up martial art trained within MMA, mainly due to the kneeing and elbow elements being so effective, it's known as the art of 8 limbs after all. Also boxing, kickboxing and even karate and Taekwondo can be seen within an MMA fighter’s game. The stand-up element of MMA will test your cardio to the limit, especially if not executed effectively and intelligently. Every fight starts on the feet, so it makes sense that investing lots of time in perfecting it is a must. This can be Judo and Sambo style, wrestling style, even Muay Thai clinch throws and Jiu-Jitsu style takedowns, also not forgetting on how to defend all of these. An effective take-down will win lots of favour with the judges, so getting this right should be near the top of your list of things to work on. 3) Ground work - Brazilian Jiu-Jitsu, Submission Wrestling; training either Gi or No-Gi, compromising of ground control and submissions. Either with Gi ( traditional Jiu Jitsu uniform) or No-Gi, if you don't get this right from the outset, you will struggle to defend or attack on the ground. 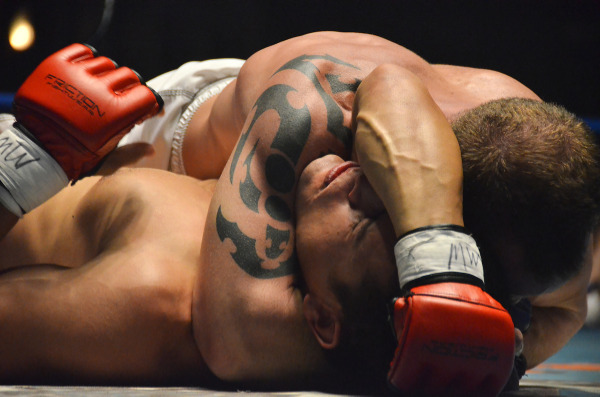 At amateur level, nearly all fights will be won on the ground, as invariably no head strikes are allowed. Strength and conditioning is a vital part of the journey to becoming an MMA competitor and all round athlete. Programs for sports have to be carefully thought out and monitored. Planning out successful fitness and Strength & Conditioning schedules require years of experience, as well as understanding how we get the most efficient use of our training time. Brazilian Jiu-Jitsu requires, among other things, a strong grip for both push and pull, powerful legs for bridging and a gymnastic level of movement on the floor. Muay Thai requires a high level of stamina, as well as an often brutal approach to body, and more often than not, leg conditioning. Never rule out a weights routine and ignore the myth that weights slow you down or always has to add unnecessary bulk. Talk to the experts and bear in mind that any routine which is sports specific, is and has to be based on your own needs, body type and sometimes work schedule and availability. Contact us for more information or a free consultation.